“Let’s plant catnip”, they said. 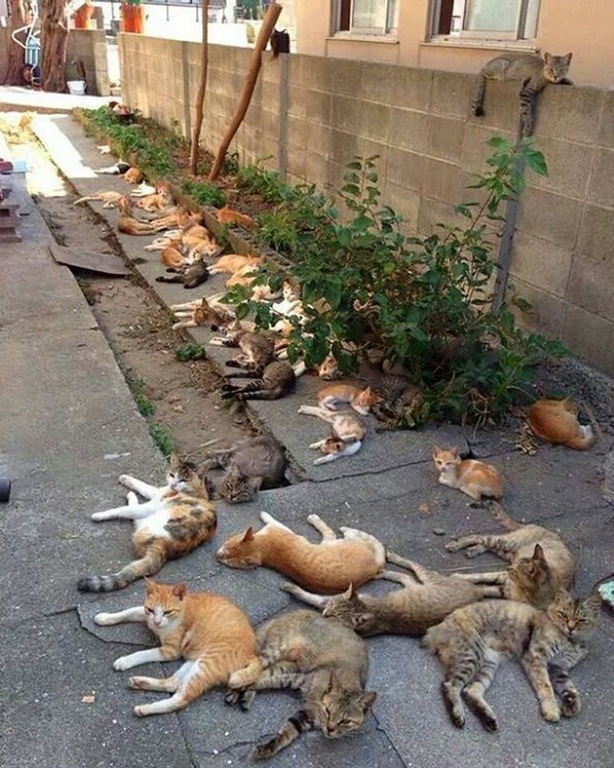 “It will keep away mosquitoes”, they said. In the previous post on some notable molecules from nature, we saw many examples of familiar and interesting compounds that can be isolated from various plants, animals, bacteria and even insects. The key point is that organisms are veritable chemical factories, and these molecules can have notable uses as medicines, perfumes, flavourants, and many other commercial applications. Obtaining pure caffeine from coffee beans? The idea behind extraction is pretty simple. We take the organic material in question, pulverize or grind it up (to maximize exposed surface area) and then add an appropriate solvent. After an appropriate length of time, possibly accompanied by heat and/or agitation, we can then filter off the insoluble material, leaving us with an extract. If this sounds vaguely familiar, it should! In fact, it’s quite possible you did an extraction today. Obviously, if you’re planning to drink the dilute extract, your choice of solvents is limited to water and perhaps ethanol (useful for extracting absinthe from wormwood, for instance). However, if you’re trying to isolate a organic compound with a fairly low boiling point, using water won’t get you very far (solubility). Instead, organic solvents with low boiling points such as diethyl ether, petroleum ether (short-chain alkanes) and dichloromethane (a.k.a. “methylene chloride”) are commonly used for this purpose, since they are easily removed by a rotary evaporator without significant losses of other volatile components. Some examples of this process from the primary literature make for interesting reading. The three examples above are illustrative, and have the advantage of simplicity. In cases where extracts are tested for biological activity (e.g. ability to kill various cancer cell lines) a more complex series of extractions are often performed after the initial one, involving adjusting the pH to separate acidic and basic components. One example (often used for bacterial extracts) is a Kupchan scheme. If we’re (extremely) lucky, the concentrated extract will be a reasonably pure sample of one molecule. Much more commonly, however, the crude will be a complex mixture of compounds that requires further separation. 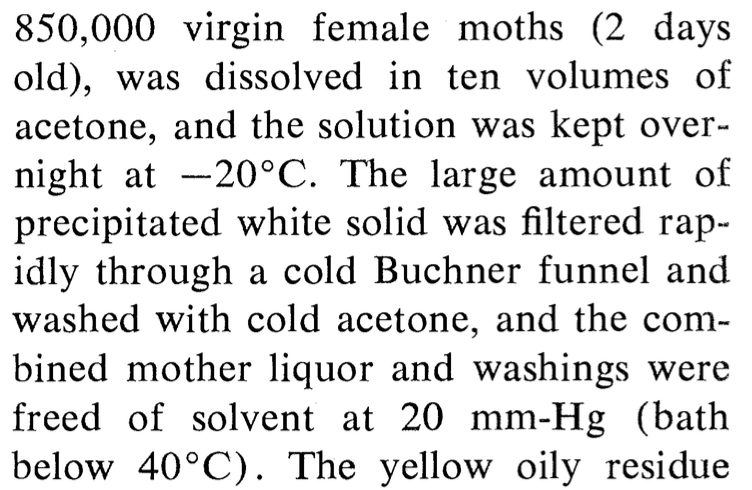 Purification of crude mixtures is a big topic – we’ll leave this for the next post. 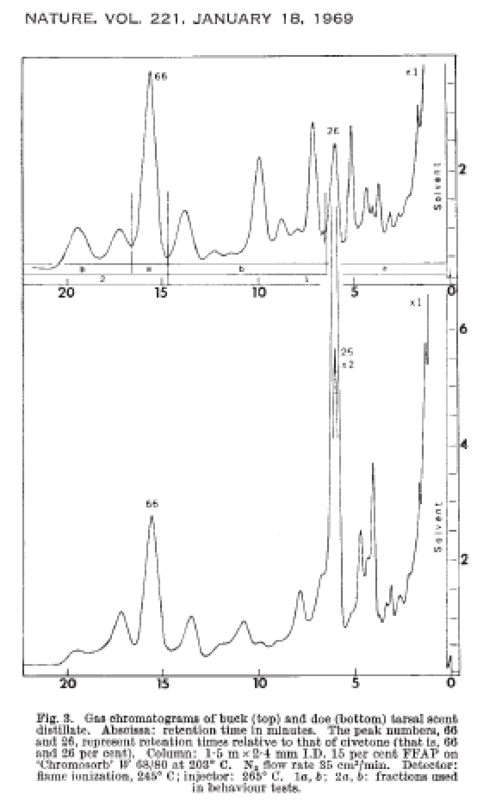 However, we can briefly mention a pair of related techniques that can quickly reveal the complexity of crude mixtures: liquid chromatography-mass spectrometry (LCMS) and gas chromatography-mass spectrometry (GCMS). Without going into too much detail at the moment, chromatography allows for the separation of a crude mixture into its individual components, and mass spectrometry (MS) determines the mass of each of these individual components. To use a rough analogy, it’s a bit like a foot race where the runners begin as a cluster at the starting line and are separated by the end of the race according to how fast they have run down the track. Once separated, they can be characterized by mass spectrometry: enough studies have been done of enough naturally occurring compounds that the MS data can be checked against commercially available databases to give a preliminary ID of various components of the crude. As an example, on the left is an example of the GCMS from the deer tarsal gland (from the paper cited above). Every peak represents a discrete compound [this is late 1960’s technology, by the way – current techniques are significantly more refined]. Inspection reveals the presence of at least 15 compounds in the crude. One of the additional advantages of this technique is that oils with fairly high boiling points can be obtained under relatively mild conditions. For instance, note that limonene has a boiling point of 176°C, but steam (100°C) is being used to distill it off. [If the two liquids were miscible, we’d distill off the water fraction first, leaving the oil behind: but since the two liquids are immiscible, the composition of the vapour phase is purely a function of temperature]. This extremely well-done Instructable shows how to prepare pure nepetalactone from Nepata leaves via steam distillation, using materials one would find in your kitchen (you can see the whole thing after you close the annoying popup window). 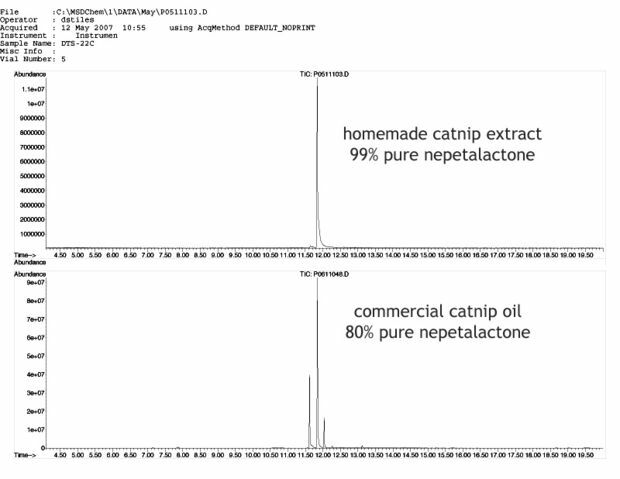 The nepetalactone obtained from this method turned out to be extremely pure: about 99% by GCMS, even more pure than some commercially available catnip oil extracts. [Just in case you’re wondering, the GCMS was not a kitchen instrument, but the procedure itself is very DIY-friendly]. Steam distillation can also be used to prepare, for example, oil of lavender, rose oil, clove oil, caraway, and many others. It’s one of the most rewarding applications of kitchen chemistry. The point of this article was merely to illustrate a few examples of isolating natural products, or natural product extracts from various organisms in order to render the process more concrete. In the next post, we’ll discuss some options for purifying those extracts so that we can actually start to talk about the analysis of individual compounds. Very nice post. I am waiting on more and i really appreciate your effort and time you need to devote to build this great site.